Marie Therese Charlotte de Bourbon was the only child of Louis XVI and Marie Antoinette to survive the French Revolution. It is thus surprising that not much has been written about this fascinating historical figure. And when she is mentioned in her mother’s biographies she is usually dismissed as either haughty and arrogant or “mentally inert”. 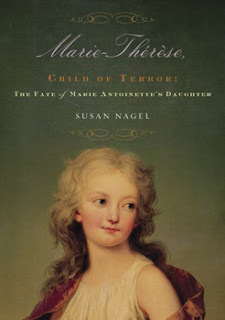 Susan Nagel in her biography, “Marie Therese: The Fate Of Marie Antoinette’s Daughter” attempts to bring the real Marie Therese to life and set the record straight on the myths that surround her. Marie Therese was born into the luxurious and decadent world of Versailles, where life was strictly regulated by etiquette and rank. Her parents had been married for seven years before the Queen finally fell pregnant and, when it happened, she didn’t give birth to the long-awaited heir but to a mere girl instead. But even if the country was disappointed, her parents were over the moon. Marie Therese was always very close to her father, while the relationship with her mother was more problematic. She also loved her siblings, particularly Louis Charles, who would die during the French Revolution. Her brother Louis Joseph and her sister Sophie died in childhood too, which deeply affected the young Marie Therese. Her privileged childhood ended in 1789 with the outbreak of the French Revolution. Although the King tried to work with the revolutionaries, granting them many concessions and calling a national parliament, it was too late. As the most radical revolutionaries took power and hatred for the monarchy increased, the royal family was imprisoned and one by one, all its members who had remained in France, with the only exception of Marie Therese, were murdered. Finally, when she was 16, the Terror ended and Marie Therese was released and sent to her Austrian relatives. Marie Therese would spend the rest of her life serving the Bourbon cause. She married her cousin, the Duc d’Angouleme cos she believed her parents would have wished it, remained at the side of her uncles, Kings Louis XVIII and Charles X, when the monarchy was restored and she was the only one who put up a fight against Napoleon when he returned from his exile. The Bourbons would be restored again, but only for a short time. Marie Therese would die in exile. Yet, despite everything she had suffered during the Revolution and afterwards, Marie Therese never stopped loving the French people and consider France her home. Nagel emphasizes how it was her Catholic faith that sustained Marie Therese throughout her trials and tribulations. She was also very chartable, helping the poor and needy whenever she could. However, the book is not without faults. Not all of the claims Nagel makes are sufficiently supported by historical evidence. For instance, Nigel claims that Louis XVI had a brief fling with a servant in the early years of his marriage because he wanted to see whether he, or his wife, were at fault for not conceiving any children yet. It was the first time I had ever heard of it and I’m still sceptical about it as such a behaviour would have been totally out of his character. For the same reason, I also find it hard to believe that he had a child with the Duchesse De Polignac, Marie Antoinette’s best friend. I guess everything is possible, but when such claims are made, they should be well-sustained and I don’t think these are. More extensive footnotes would have been very helpful, allowing the reader to verify the claims and make up his/her own mind. The book is also interspersed with passages about “the Dark Countess”, a mysterious figure believed by many to be the real Marie Therese. According to a conspiracy theory, Marie Therese had become an imbecile during her imprisonment and so, on leaving France, had switched places with her half sister Ernestine, a young girl who had been adopted by her parents, and went on to live the rest of her life in seclusion in Germany. Although both in the preface and afterwards, Nagel dismisses the rumour, I wish she had dedicated less space in the biography to a story that even she doesn’t believe to be true. As it is, it can be somewhat confusing for the reader, especially those who had never heard of this rumour before. Despite these shortcomings, I really enjoyed the book. It is very dense and chock-full of details about Marie Therese, her family and the political situation of the time, yet it flows easily. The portrayal of the royal family that emerges from it is overall positive, yet Nagel doesn’t ignores their faults and mistakes. Well-written, entertaining and thought-provoking this biography is a must read for anyone interested in Marie Therese Charlotte of France and what happened to her after the French Revolution. Marie Therese, The Fate Of Marie Antoinette’s Daughter, is a well-written, thoroughly-researched and dense, but by no means boring, biography of the only child of Louise XVI who survived the French Revolution. The author skilfully brings Marie Therese, with all her faults and good qualities, trials and triumphs, back to life again. However, the author makes some questionable claims that aren’t sufficiently backed up by proof.